It is possible to move the bridge RFLink (read this previous article about how to make a Gateway) on another computer or Raspberry Pi by improve the reception of your devices for example. 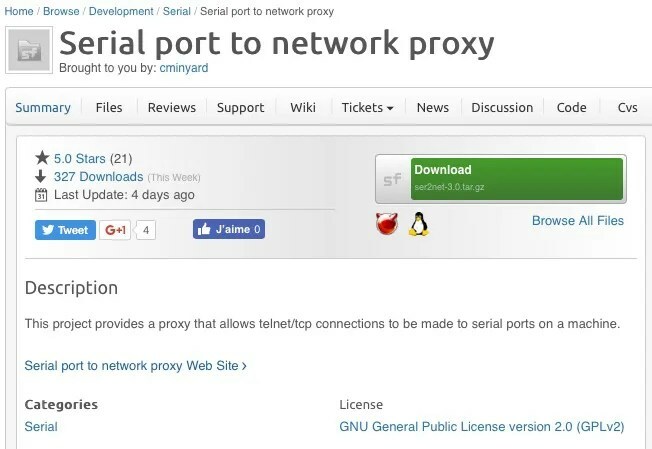 For this we will use ser2net, an Open Source project (official project page) that allows to publish on the Ethernet of the recovered data on the serial port. Is the shortest path, but I prefer to give the procedure in the case or your distribution does not support the apt–get command (under some configurations Docker). We begin by downloading the latest version available on Sourceforge. It is much easier to install ser2net help the command apt-get. Get the serial port on your gateway RFLink is plugged (more details in this previous article). Plug the gateway and run sudo dmesg -s 1024. This command allows to recover the system log. At the end of the log is located (the gateway RFLink) USB device just connect. In my case, it is connected to /deb/ttyACM0. Go down the configuration file and comment out the last lines on telnet and add it. The baud rate of the RFLink East of 57600 baud. The data will be returned to port 6000. Restart ser2net to take into account the configuration. We now have a RFLink network Gateway very easy to install under Domoticz (or any other software automation also). That is, you now have a Gateway network at a lower cost (no need to add an Ethernet shield). You can deport the gateway on another post to improve reception for example. This method is not limited to RFLink, we can actually publish it on any data received on the serial port. We can for example use it to transform a serial (USB) MySensors gateway to a network (LAN) gateway. Why /dev/8DATABITS?? I have RFLink433E and i dont see in my rasspberry /dev/8DATABITS. I well try /dev/ttyACM0 its my rflink device but result is the same.